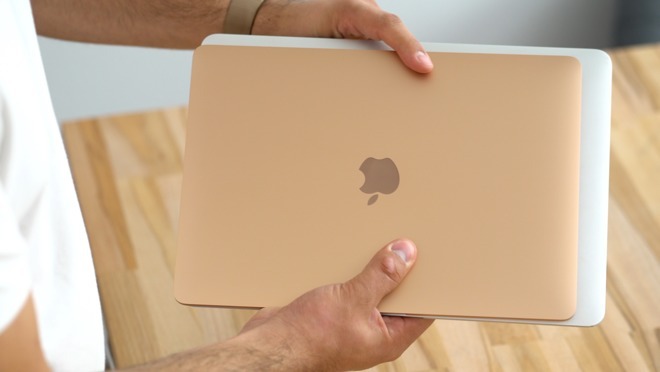 Like other Apple products, MacBook Air is now available in three different color options: silver, space gray and gold, which is combined with one of the variations of the Apple Watch Series 4 stainless steel and the new color iPhone XS. MacBook Air 2018 is very similar to the MacBook Pro, except for a few key details. The device has a wedge shape in the folded condition as the previous generation. A distinctive feature of the MacBook Air to 2018 is the biometric scanner Touch ID. It works thanks to the T2 chip, which not only handles the biometric authentication, and is responsible for SSD encryption, support for Hey Siri and more. Besides that, everything else in the new MacBook Air borrowed from the MacBook Pro last generation. 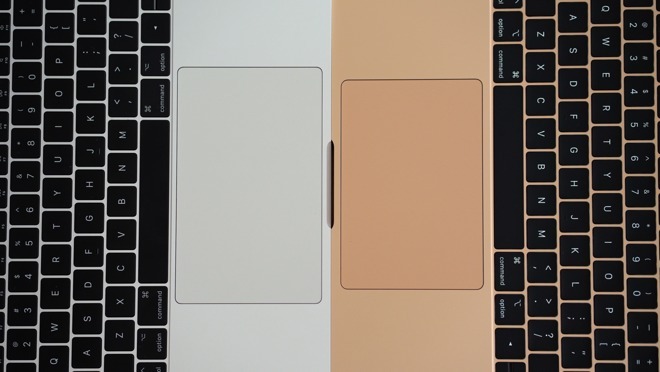 Keyboard, a speaker, Force Touch trackpad (though slightly smaller), the lack of the Apple logo with backlight and metal hinge the two devices are similar. 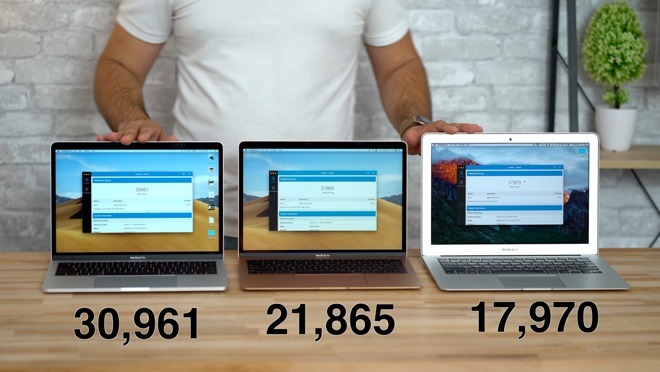 Comparing the size and weight of the new MacBook Air with the previous model, you notice that a new version was smaller and lighter. In the “thick” case 2018 MacBook Air has the same thickness as the previous generation open. 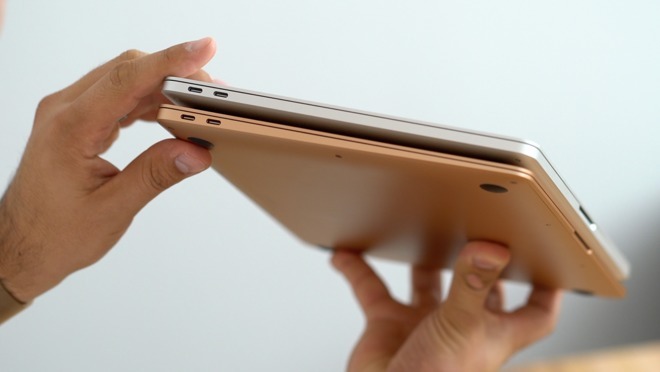 Due to its shape, the new Air seems thinner than the MacBook Pro, but actually it is thicker than 0.02 inches. The wedge shape had a positive impact on the ergonomics of the device – unlike the MacBook Pro, Air 2018 creates a slope, which makes prolonged typing on the keyboard, start to hurt your hands. 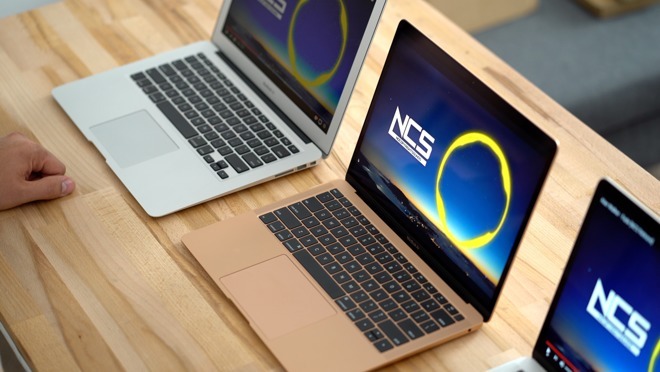 The results of the test Geekbench 4, 2018 MacBook Air with Intel Core i5 processor with a clock frequency of 1.6 GHz and 4 MB L3 cache, 4 received 246 points in single-core and multi-core 7 788 in the test. 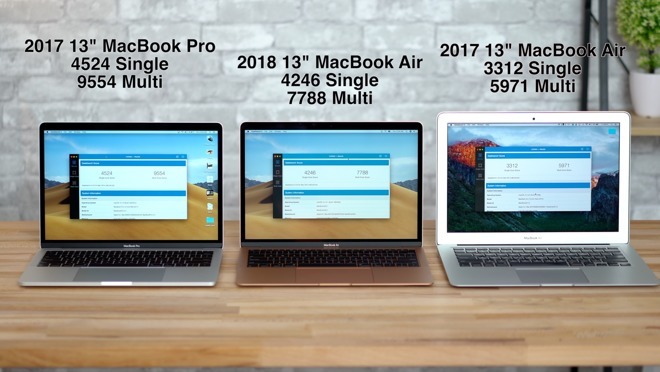 For comparison, the 13-inch MacBook Air 2017 scored 3 312 in single-core and multi-core 5 971 in the test, while the 13-inch MacBook Pro without Touch Bar – 4 9 424 and 554 points respectively. Based on these results, a new Air is close in performance to the Pro model. The main difference from other laptops in this comparison is the Intel 8th-generation MacBook Air installed in 2018, so it should be faster when encoding HEVC files. MacBook Air2018 comes from 50.3 WHr battery which is smaller in comparison with the 54 WHr of the previous generation Air and 54.5 watt-hour battery 13-inch MacBook Pro. According to Apple, the batteries of the new Air will be enough for 12 hours of continuous operation. The previous model MacBook Air and MacBook Pro are working on 2017 15-watt dual-core processors, while the MacBook Air is equipped with a 7-watt dual-core processor, which provides greater energy efficiency. Also, the new MacBook Air comes with power adapter, 30 watts of power. The big downside of the previous generation MacBook Air was its display. The resolution was very low – only 1440h900 pixels. It was fitted with LED TN panel, which narrowed the angles. 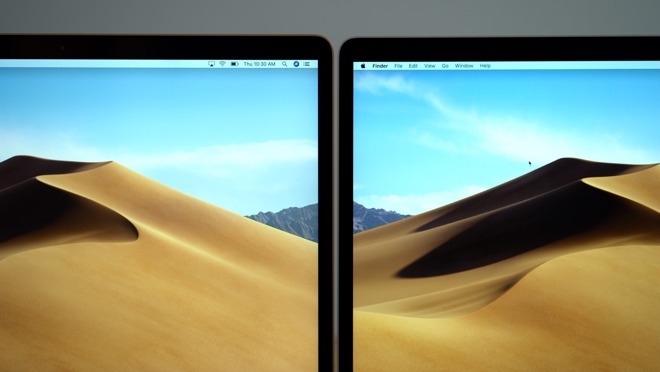 In 2018, the MacBook Air has got a 13.3-inch Retina display with a resolution of 2560 by 1600 pixels. Despite the fact that 2018 MacBook Air has the same resolution that the MacBook Pro, it does not support wide color gamut P3. The Pro model can boast a better contrast and more vivid colors. But this is not the only difference in the laptops. Screen brightness MacBook Air is 234 nits, while the 13-inch MacBook Pro – 458 bat. Surprisingly, the previous generation MacBook Air was brighter – 336 nits. 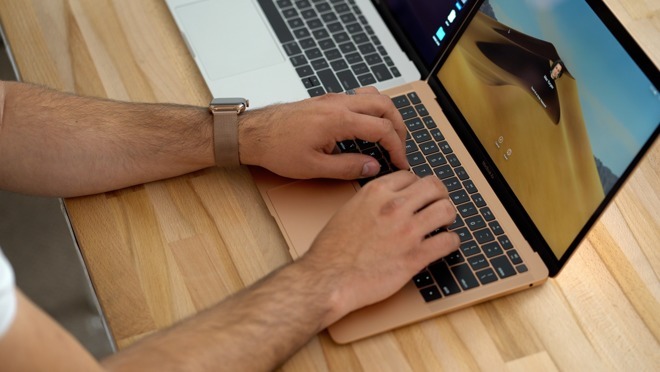 The new MacBook Air received a keyboard with the butterfly mechanism of the third-generation Apple similar to the one that equipped MacBook Pro 2018. It has a silicone lining which helps to prevent debris from under the keyboard. The trackpad of the new Air is slightly larger than that of previous generations, but it is smaller than on the MacBook Pro 2017. New speakers MacBook Air speakers look identical to the 13-inch MacBook Pro. The new sound is noticeably louder and clearer the previous model, especially the bass, which became more rich and deep. Apple still sells the previous MacBook Air for 999 dollars. The new MacBook Air costs 1 $ 199 in its base configuration, while the 13-inch MacBook Pro without the Touch Bar is 1 299 USD. Depending on needs, consider the MacBook Air 2018, as a full working tool to the next much years.